Well girls, yes everyone and their mother right now is talking about this palette and yes I really think its worth all the hype, talk and love! When I first heard this was coming out I was a little sceptical about his because I have the first Naked and love it but I didn't see the point in buying Naked 2 even though it is very pretty. So when I saw the shades in the naked 3 I fell in love instantly. 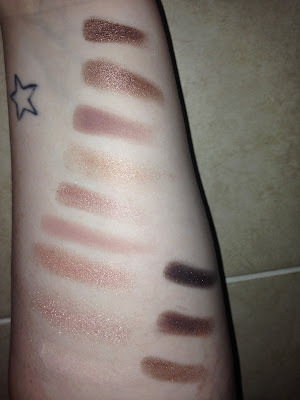 The rose toned shades in this are Divine and I thought they would look lovely with my skin tone. I love the packaging on this one, the naked 1 has a cardboard Velvet packaging that has a magnetic closure which I do like but like the naked 2, the naked 3 has the tin packaging which has a click and secure closure. The naked 3 has a rose gold tin with ruched detailing. In this palette you get a doubled ended eye brush that has a side to pack on colour on the lid and another fluffy side to blend colours in the crease. Also in the box you get a sampler of Urban Decay's eye shadow primers. You get four little pots that say you have a weeks worth of primer. The samplers you get: Original, Eden, sin and anti-ageing. So the same as the other two, this palette has 12 shades which range between two fully matte shades, satin mattes and then shimmery shades. I love all of the shades in this palette obviously I have my favourites which are burnout, limit, buzz, nooner and darkside. but I can honesty say I don't dislike any of them. The one I have a slight problem with is Dust because it is a strong glitter shimmery shadow you get a lot of fallout but I can live with that. These shades like all of urban decays eye shadows have incredible pigmented and they blend super well. All in all this is by far my favourite of the three nakeds from Urban Decay. I just think the rosey toned shades suit me more and its more my style. I think this palette is nice to have and for me I'm going to get a LOT of use out of it. If you are someone who has the other two naked palettes I can honestly say this is nothing like them and I do think it is a nice contrast from the other two naked palettes. I really don't know how I happened to get this palette early because I was told by a Urban decay shop assistant that this palette would not be out in Ireland until the 16th but one day after college I went to have a look at the naked 3 in another Urban Decay shop and the lady told me there they would be selling it on the 12th. So I obviously went in on the 12th and got it. There was only a few left when I got mine. But as far as I know this is available in all Urban Decay stores on the 16th of this month and be warned this will sell out fast!! The sales assistant even told me in build up for this palette to be released they had sold out of the Naked 1 & 2! So if this is on your daughters, girlfriends, mother or anyone belonging to you Christmas list I would be up early on the 16th to grab it before it goes! Have you got Your Naked 3 Palette?